Going by one definition of this highly elastic term, N R Narayana Murthy could be considered "anti-national" for his plain-speak about Indian IT companies, says Kanika Datta. Now that the issue is convulsing the headlines on almost a daily basis, this is a good time to do an "anti-national" check of Indian business, the constituency that collectively expressed so much hope in Narendra Modi's economic agenda. 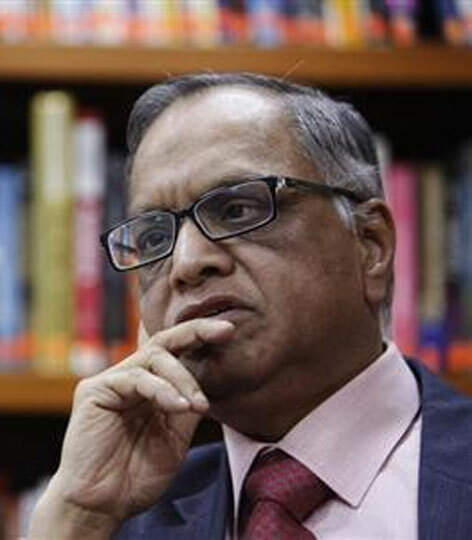 Going by one definition of this highly elastic term, N R Narayana Murthy could be considered "anti-national" for his plain-speak about Indian IT companies at the Indian School of Business in Hyderabad on Tuesday. He excoriated the Indian IT industry for acting like "immigration agents" for their employees in guaranteeing them visas and Green Cards for offshore work and went as far as to suggest it had a responsibility to create jobs for American youngsters. Creating jobs for foreigners? Our jobs versus their jobs? That would have touched some nerves in the political establishment. In fact, Mr Murthy was making a subtle and practical point. It is hard to deny that Indian IT has developed a global reputation for usurping local jobs, a sophisticated version of the demonisation to which Mexicans are currently being subjected. This may be a distorted notion, amplified by the artificial indignation of foreign media and shrill triumphalism of the domestic press. Being perceived as generating jobs for local people at a time of slower growth can be a handy reputation-enhancing tool to ensure the durability of the Indian IT companies in their key markets. Luckily, no one is likely to accuse a respected pioneer of India's global IT revolution of "anti-nationalism", even if this most amiably dignified of industrialists is unlikely to yell "Bharat Mata Ki Jai" on random occasions. Still, his statement unwittingly highlights a fundamental tension between the brute patriotism that informs the political discourse today and the realities of doing business in an acutely competitive global environment. No one understands this better than Mr Modi, which is why he has jettisoned any hint of nationalism in his bid to attract private sector investment and expand employment. Over the past two years, he has regularly signalled his intent with Make in India (September 2014), Digital India and Skill India (both July 2015) and StartUp India (January 2016) plus some effort to nudge the country up the World Bank's Doing Business ranking. The only trouble is India Inc does not appear to be responding with due patriotic fervour. It must be said, however, that Indian business' appetite for outbound investment has also waned. Foreign direct outbound investment in 2014-15, which roughly coincides with Mr Modi's first year in power, fell 68 per cent. Officials in the Department of Industrial Policy and Promotion (DIPP), who appear to have been infected by the muscular nationalism of their political masters, saw this as a sign that Indian business was regaining confidence in the Indian economy. Unfortunately, other data do not corroborate DIPP's optimism. The Economic Survey shows that gross fixed capital formation as a percentage of gross domestic product (GDP), one rough and ready indicator of business confidence, has fallen sharply, from 33.4 in 2012-13 to 29.4 in 2015-16 (the latter being a provisional figure). Independent analysts suggest that the falling outward foreign direct investment (FDI) figures have more to do with an ailing global economy than substantial renewed interest in India (just as much as the composition of inward FDI numbers overstate the case). All the same, even the most pro-national Indian should take pride in India's outbound forays since the start of this century. India is now the UK's third largest investor - Indian direct investment to that country jumped 65 per cent in 2015, creating 9,000 more jobs, which may partly explain why Tata Steel isn't getting quite the bad rap it would have for its plan to close or sell its Welsh plant. "The Empire Strikes Back" has been the cliched idiom on which the Indian media falls back to describe developments of this nature, but Mr Murthy probably has a shrewder grasp of the realities of business. Global investment is agnostic when it comes to nationalism. On the whole, it is clear that that the only "ism" that business, whatever its provenance, respects is opportunism. In the context of the Panama Papers, it is interesting that the bulk of outbound investment from India in the past decade or so has been directed towards tax havens - Mauritius, Singapore, British Virgin Islands (all former British colonies!) and the Netherlands. Anti-nationalism or sheer resourcefulness? In the business world, those judgements are likely to be considered quite pointless.